Whilst Mick, Mo, Judy and Stephen were being seasick on the way to Antarctica, Clive and Ann were heading North in K-Nine. Having been as far south as we could drive our only choice was to head north! Returning to Rio Grande we stopped to visit the Silesian Mission. The Mission was established to protect the Yamana Indians from gold prospectors and sheep farmers and quickly attracted over 1000. In 1920, an anthropologist counted only 276 surviving Yamana Indians mostly on Thomas Bridges Estancia which we had already visited. The Mission had a museum of photos and artifacts of the Indians which we found fascinating. What amazed us was that there were people living in the Stone Age during the 19th and 20th Centuries. We wandered around the large site which is part farm, part religious conference centre and part historical monument. The first parish church of Rio Grande stands within the site along with lots of ancient farm machinery including a traction engine gradually rusting into oblivion under the never ending salt laden winds. One plus for us was that we were permitted to stay overnight on the premises which gave us a chance to really celebrate New Year. Although there were just the two of us we enjoyed a good meal, lots of wine and a Baileys or two, watched a DVD of March of the Penguins and collapsed into bed around 00:30. The film was amazing and if you haven't seen it I would recommend it as an incredible documentary of the life of the Emperor penguins in Antarctica. Our plan now was to turn off the main road to drive to Porvenir via the gold route, continue on around the lagoons to see the flamingos. However gold and flamingos turned into gauchos and, dolphins. You never know what might happen next on this journey. After leaving Rio Grande we drove the 90 or so kilometres to the border with Chile at San Sebastian. The border was quite easy with the usual search for food stashed away in all sorts of hiding places. Fortunately we only lost the sacrificial stuff we had left on view in the fridge. All except the olives which neither Ann nor I like at all, and which had come off a pizza. The road now was ripio ­ unmade with a surface of chippings, Mostly it was reasonable to drive on but required concentration which was fortunate I suppose as the scenery continued to be unutterably boring. We reached the coast and soon found the turning onto the gold trail. It was narrow but the surface was good. We passed numerous guanacos which elegantly leapt the nearest fence and scooted off to a safe distance. A few bolder ones just stood and looked at us snootily as we ground our way up the steep slope. The land at the top was undulating and as we descended one slope we came to a muddy patch in the road. This was not so unusual and we thought little of it. The right hand side appeared to be the easiest and drove over. We were almost across when the van lurched dramatically to the left and stopped dead. I climbed out with difficulty as the van was now tilted over at nearly 10°. 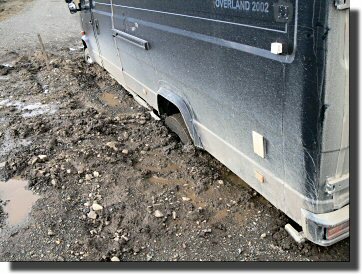 The surface next to the van to the far side of the road was a quagmire covered by a dried crust of mud. It looked easy to walk on but shivered as you stepped on it. It even withstood my weight in places but it was not difficult to suddenly have my Wellington boots almost submerged in mud. 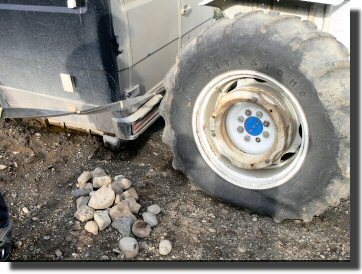 We decided to see if we could dig the van out and put rocks from the plentiful supply lying around under the wheels hoping against hope that we would be able to drive out. Digging down we soon discovered that any hole we dug immediately filled with water. Pushing my spade under the back wheel revealed that the ground below it was very soft and digging out would result in the van sinking further. The road ran along the side of a hill which dropped sharply on the right hand side. Assessing the situation it appeared to me that the road had been repaired recently by digging out a large hole to resolve a previous problem and back filled it with earth and rocks. However the solid earth on the right remained untouched and without a drain the repaired area had soaked up a lot of water until it was just liquid. The occasional vehicles using the road were small pickups and could just cross the crusted surface. 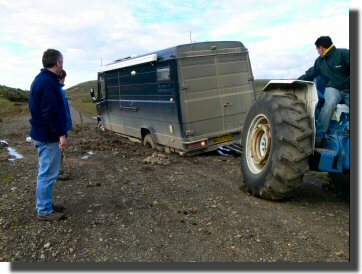 Our 7 ton vehicle was supported by 3 wheels until the rear wheels reached the end of the hard surface and then the ground gave way beneath us. I realized later that the van was prevented from sinking further because the solid steel rear bumper was resting on the very end of the hard surface. Our van was effectively trapped in ½ metre of mud. Wait for someone to come past and ask for help ­ possibly days. Walk to the main road and hitch a ride to Porvenir to get help about 50 kms away. Walk to find an estancia somewhere in the area to ask for help. We decided on options 3 as our primary objective. So we put on warm clothes packed a rucksack with some food, water, wet weather gear, a torch and one or two other things and set off. It took us over an hour to get back to the main road. Along the way we had spotted the bright red roof of an estancia in the distance. After 8.5 kms (over 5 miles) we reached the Estancia Concordia which was a sheep (around 10,000 of them) farm. As we reached the main house we were greeted by two cautious women. When we explained our predicament they were most kind and hospitable. The men were out checking fences even though it was New Years Day. We were invited in and given coffee and cake. Excellent. We chatted for a while as all the ladies in the house spoke English more or less. Then the 5 men returned earlier than expected. These modern gauchos came speeding up the drive on dirt bikes and slid to a halt in showers of gravel. There were 2 teenagers and 3 men, all belonging to the same family if you include in-laws and so forth and they were very willing to help. 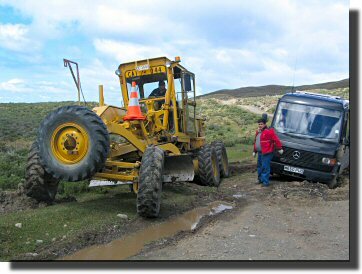 At first they thought their 4x4 would be enough to sort out the problem but I thought that a tractor would be needed. They agreed when they saw a picture of K-Nine. 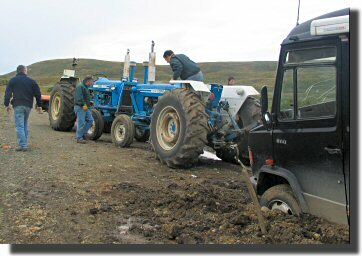 However the tractor had not been used for sometime and had to be tow started down a hill. We returned to K-Nine in the 4x4 to wait for the tractor. When Alex, the father saw the problem he was confident that the tractor would do the job. When it arrived I gave them the army nylon towing strop I had and the heavy duty shackles which they hitched to the back of K-Nine. The tractor huffed and puffed but did not move it a cm. So Alex and his brother in law then attached it to the front of K-Nine - the only result being spinning wheels. Alex had also asked me to drive K-Nine as well which I was reluctant to do. As I feared, K-Nine settled even further into the mud which now reached almost to the top of the wheel. The next idea was to lift K-Nine at the rear using the tractors hydraulic lift (used to raise ploughs etc.). This worked a treat but it couldn't lift high enough so stones were put under the rear bumper to rest on so that the van could be lifted in stages. But when the load was taken on the stones the bumper moved up and damaged some of the bodywork ­ the van was too heavy for this to work. It was nearly 21:00 now but being so far south there is only around 4 hours of darkness ­ it would be light until at least 23:00. So a new plan was hatched. If one tractor was not enough then two should do the job. Everyone rushed off leaving us with Gonzales, Alexs son who was a very presentable young man and who did a grand job keeping up our morale. The second tractor was borrowed from another estancia and driven to us in only 45 minutes although it seemed much longer. The two tractors were hitched in tandem to the front of K-Nine and with me driving again we gave it all we had. But it was the same result ­ spinning wheels and bigger holes. The tractors then tried pulling K nine out backwards. More spinning wheels, then after attempt to jerk it out of the mud there was a loud crack and the bump sheared several bolts, crushed the metal skirt and twisted the light cluster up so high it was impossible to open one of the rear doors. At this point our team of helpers gave up and went home. However they said they would arrange for help from someone else as Gonzales had to go into Porvenir the next day. Someone would come to let us know what was going on, probably around lunchtime. Living in our van overnight at an angle of 10°. was a new experience. We ate food from plates on our laps as they kept sliding off the table and sleeping in bed felt like sleeping standing up! In the morning we contemplated doing some digging but with only a small shovel we would not make much impression on it before help arrived so we gave that idea up. We whiled away the time until the army arrived in two 4x4s. Our hopes soared but they squeezed past us across the sloping bank and said they couldn't help us. We had just finished an early lunch when another 4x4 turned up. It soon was clear from the jolly chap driving it that this was our help. From the few words we understood something was coming which could do the job. A few minutes later we heard the roar of a loud engine and then an enormous earth mover charged over the brow of the hill. This was a grader ­ one of those bright yellow things with six wheels and about 3 times the size of K-Nine hereinafter called the Big Yellow Monster or BYM for short. The driver of the BYM slowly tried to get past across the mud but the front wheels immediately sank right in. So he drove across the steeply sloping bank on the other side. The earth vibrated and shuddered, shaking K-Nine in the process. Once it was in front a thick wire rope was wound around the front spring mountings of K-Nine and attached to the rear of the BYM. Taking the strain the rope cut some nice slots through the fiberglass bumper then with a roar of the engine the BYM unhurriedly pulled K-Nine out of the pit accompanied by lots of squelching noises. We were delighted and while the BYM made a new road for us to drive back over, we went down the road to turn around. The road was narrower than the wheelbase of K-Nine so this wasn't at all easy. Eventually after a several kms we found a slightly wider section and after about million backwards and forwards manoeuvres we returned to the scene of the disaster. The BYM had done its job and we drove along a firm of ground to the far side. We gave our profuse thanks to the chaps who so kindly pulled us free. They refused any payment as they were the road gang responsible for road repairs but the load of beers we gave them went down very well. After returning to the Estancia to thank them for all their kind help and hospitality we followed the main road along the coast which was very beautiful and camped up by edge of the sea in a little bay with a few isolated fishing huts nearby. It was windy but sunny and there was quite a lot of surf as the waves stirred the shingle with that wonderfully soothing sound. No sooner than we'd stopped when I saw a dolphin (possibly a dusky dolphin) and then more and more. They were in playful mood leaping out of the water, having races and amazingly surfing the waves. It was an amazing and cheering sight after the stress of the last couple of days. So in brighter spirits - helped along by a bottle of wine, we settled in bed for a peaceful and relaxed night. Home - This page last changed on 2007-01-18.